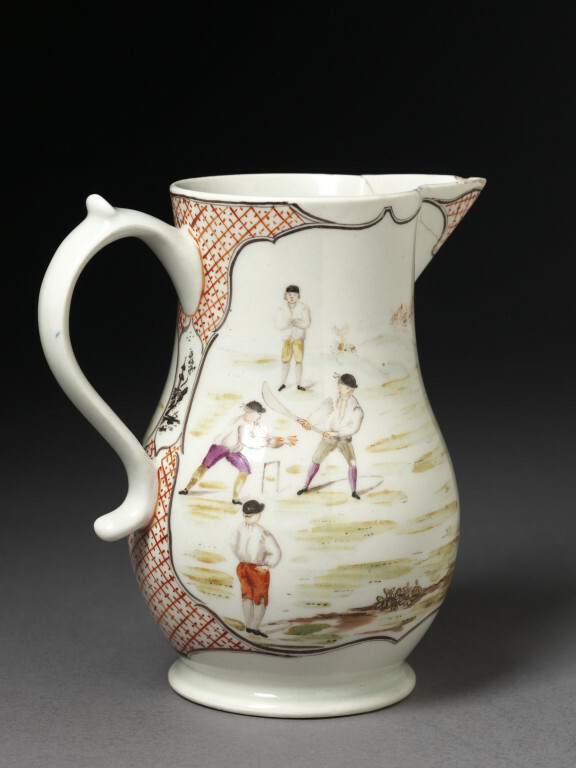 Jug of soft-paste porcelain painted with enamels. Pear-shaped with a scroll handle. Painted in an irregular lobed panel with a scene inscribed below with 'The Game of Cricket', depicting players on the Denes in Lowestoft. Below the spout and at the back above and below the handle is a red trellis diaper. The image is copied from a print by H. Roberts after L.P. Boilard. 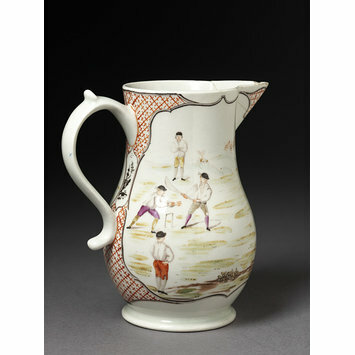 Jug of soft-paste porcelain painted with enamels, Lowestoft porcelain factory, Lowestoft, ca. 1769-1770. Clarkston R. J. & Mallet J. V. G. A Problematical Group of Eighteenth-Century Porcelains.Transactions of the English Ceramics Circle. 1971, vol. 8, part 1. pp. 80-121.